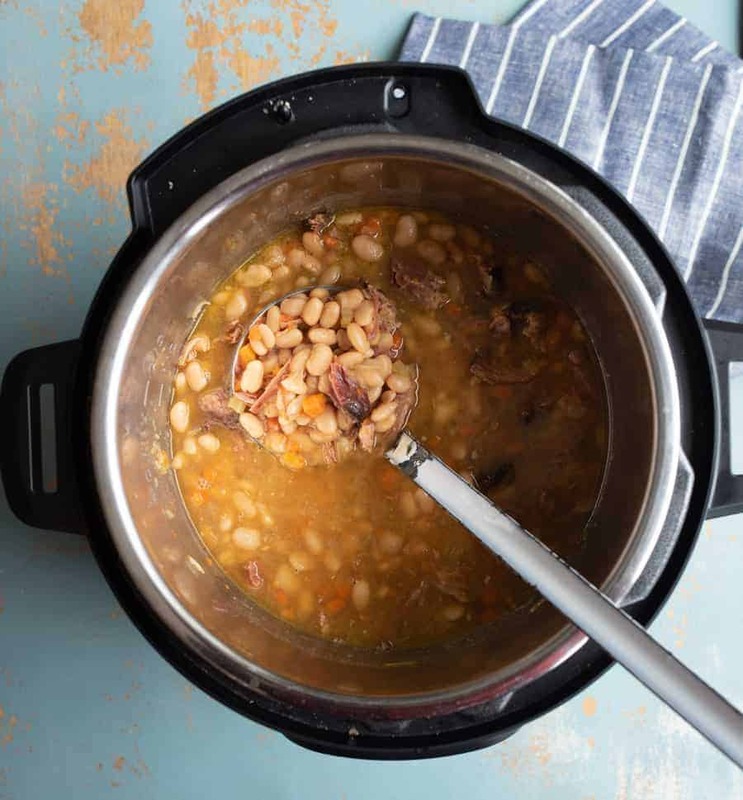 Classic Ham and Bean Soup made in the Instant Pot with ham, dry great northern beans, vegetables, and a few other simple ingredients and cooked in about an hour thanks to use a pressure cooker. Ham and bean soup with a side of cornbread is my happy place. My mom used to buy canned bean and bacon soup and it was my favorite to warm up eat. Now I make big batches of homemade ham and bean soup and keep it in the freezer to warm up when the craving hits. I love that it’s full of flavor, vegetables, and hearty fiber and protein packed beans. It’s a soup I can eat over and over again and it always hits the spot. 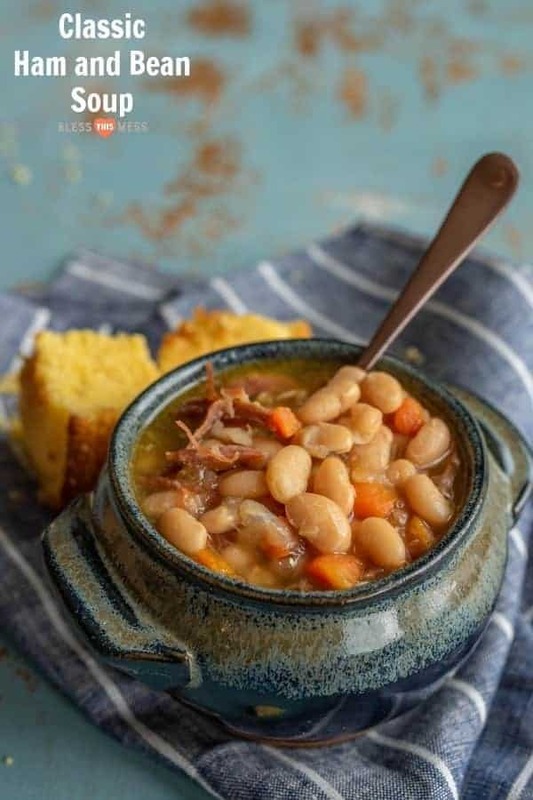 Save your ham bone to make this soup or simply find ham shanks or hocks at the grocery store if you don’t have a ham bone in the freezer. This soup is so budget-friendly and it tastes so great that it’s sure to make it in your meal rotation to be enjoyed often. 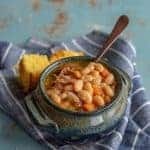 Don’t let cooking dried beans scare you because they are so easy to cook and using a pressure cooker makes it a super quick job! No pressure cooker? I have included slow cooker and stove top directions as well. This is a recipe that I make over and over again and I’m so excited to share it with you today. I’m also excited to be working with my friends at Hurst’s Beans again this year because I love their products and I love working with them to share recipes with their awesome beans. Hurst’s is a 4th generation family-owned company that is based out of Indiana (my home state! ), and they’ve been a brand that has been in my cupboard, my mom’s cupboard, and my grandma’s cupboard for years and years. I grew up loving the 15 Bean Soup Mix, and their products are ones I use and know well. They grow their beans in the US and Canada (yay! ), and the flavor packets really are just seasonings in a convenient little package. They are gluten-free and vegan and have no added MSG. This is a great brand, and I can’t wait for you to bring them into your own kitchen if you haven’t already. The 40 minute cook time lends to beans that are still “toothsome” with plenty of structure and chew. If you like a softer cooked bean, cook for 50 minutes. 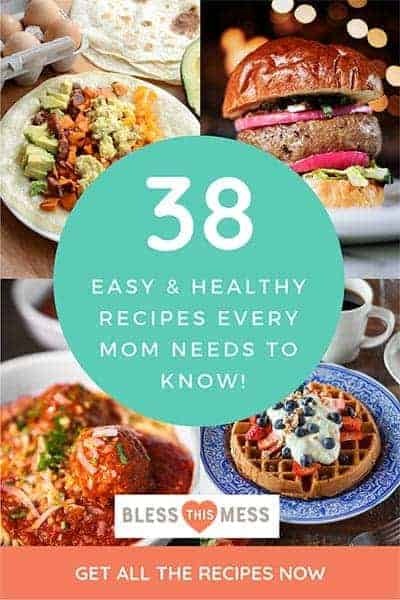 This is the fastest way to make this recipe. If you have the time, feel free to let the Instant Pot do a “natural pressure release” at the end of the cooking time. I tried this recipe with and without the included seasoning packet, and I really liked using the seasoning packets. It adds a great smoky flavor. It’s gluten-free, too. If you are sensitive to salt though, try adding only half and adjusting additional salt to your liking. You can find these beans at Wal-Mart and other local grocery stores (like Smith’s and Kroger). If you can’t feel free to request them from your local grocer. You are free to use the pork/ham product of your choice – using a leftover ham bone works great. I just toss my ham bone in a zipper-topped freezer bag after dinner and keep it there until I’m ready to make soup. If you’d like to thicken the soup just a bit, you can blend it for just a few seconds with your immersion blender or you can blend 2 cups of the soup in a traditional blender and then return it to the pot. Blended beans are a great natural thickener. To make this recipe on the stove top, saute the veggies as directed and then add everything else to the pot. Bring the mixture to a boil and then reduce the heat to a simmer and cover. Cook covered, stirring often until the beans are tender, about 4 hours. 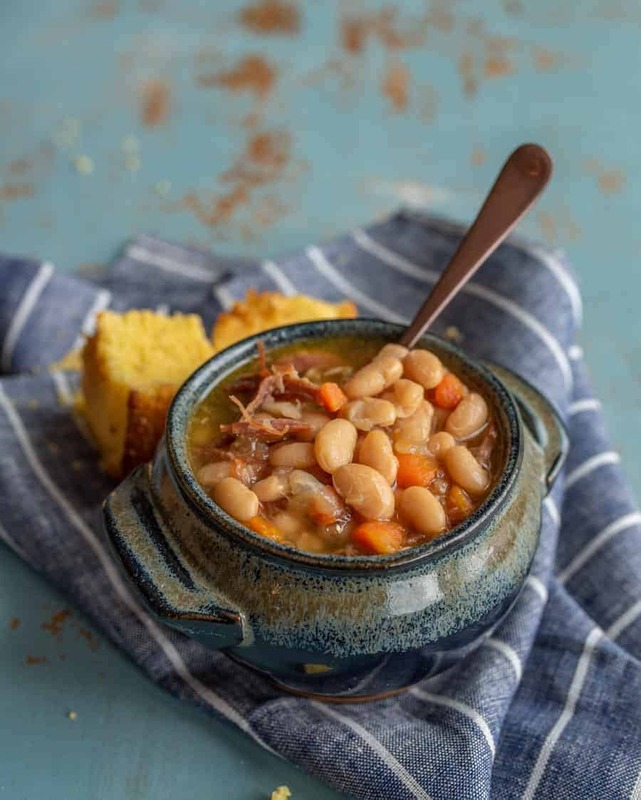 To make ham and bean soup in the slow cooker, saute the veggies as directed and then add everything to your slow cooker. Cook on low for 7-8 hours or until the beans are tender. No! They cook just fine without soaking. You can if you’d like, though – simply soak them in water overnight or for 8 hours before using. If you soak your beans, reduce the broth in the recipe by 1 cup (from 8 cups to 7 cups). 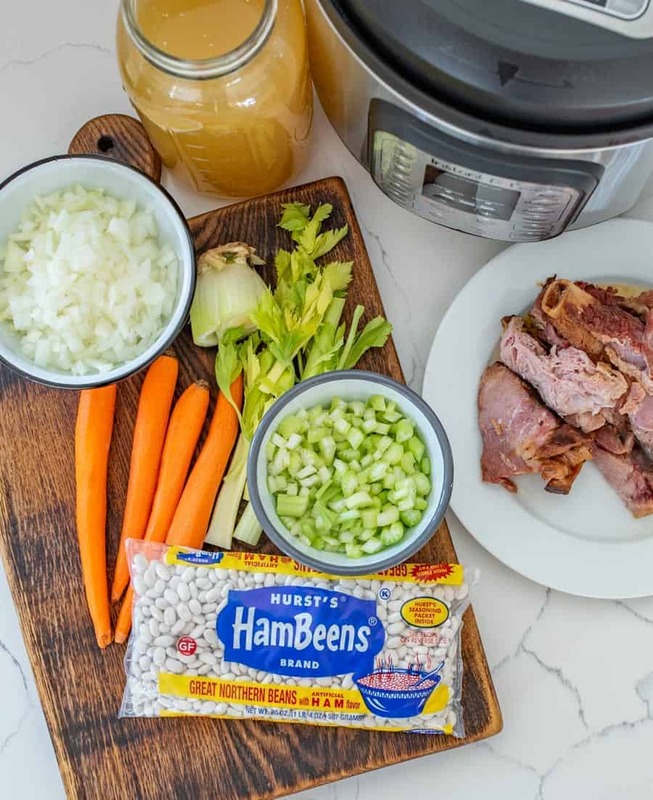 Classic Ham and Bean Soup made in the Instant Pot with ham, dry great northern beans, vegetables, and a few other simple ingredients and cooked in less than an hour thanks to use a pressure cooker. Select browning/saute to preheat the pressure cooker. Add the olive oil or butter and onion, celery, and carrots. Saute until the onion is tender, about 3 minutes. Add washed and sorted Great Northern beans to the pot, add the seasoning packet, and the broth. Stir to combine. Add the ham hocks, shanks, or ham bone to the pot. Lock the lid in place, make sure the vent is set to seal, and select high pressure and 40 minute cook time. When the cooking time ends, use the quick pressure release. When the valve drops, remove the lid carefully. Remove the ham pieces and bones and place them on a plate. Remove any extra meat and discard the non-edible pieces. Return the ham meat to the pot and stir to combine. See the post on cooking times for the slow cooker and stove top. 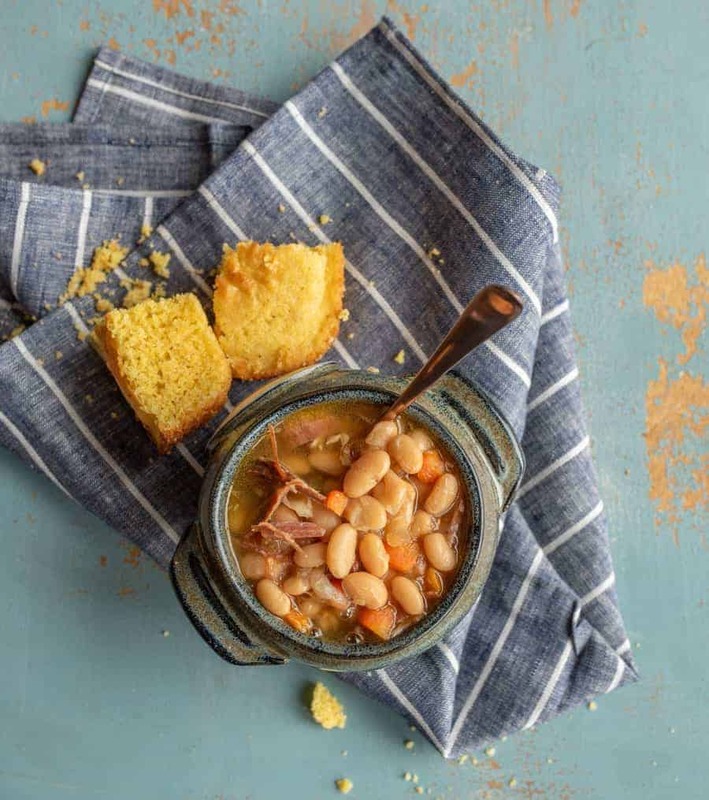 Need a cornbread recipe to serve with your ham and bean soup? I got you covered! A great recipe made using a great product from a great company that I genuinely love working with. How is this my job?! THANK YOU for being here and please enjoy this recipe, from my kitchen to yours. 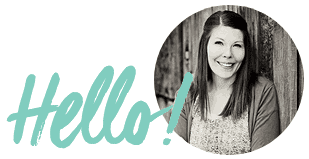 Holler if you have any questions, can’t find the beans (Smith’s in Utah carries them as does Wal-Mart), or need some encouragement for your first time cooking dried beans. I’m here to help!